A former senior Burundi military officer who quit the army this year said on Wednesday he had launched a new force to oppose President Pierre Nkurunziza, whose re-election for a third term this year has plunged the nation into chaos. The formation of FOREBU, an acronym based on its French name Force Republicaine du Burundi, which was announced by Edouard Nshimirimana in a statement, was the latest challenge to Nkurunziza's rule by a military officer following a coup attempt by a group of generals in May. It will further stoke worries that violence in Burundi could turn into full-blown conflict, and raise alarm about unity in the army, which was rebuilt after Burundi's civil war ended in 2005. The army now includes a mix of one-time rebel fighters and professional troops that experts say could fragment. Unrest in Burundi has already rattled a region where memories of Rwanda's genocide in 1994 are still raw, prompting the African Union to propose sending in peacekeepers, a move the government rejects. "Since Pierre Nkurunziza took power 10 years ago, the country and Burundians are coldly and outrageously taken hostage by a bloody dictatorship embodied by an irresponsible president and a politically futureless system," Nshimirimana said in an audio statement, distributed widely to Burundian journalists. His statement was accompanied by a still image of Nshimirimana, a lieutenant colonel who had been a top communications officer, in army beret and fatigues. He fled the army in September. The statement did not specify whether military action was implied not did it detail the size of the force. It did not say whether the new group would cooperate with other rebel generals, who have said they would resort to force to oust Nkurunziza. Months of international efforts to start political dialogue have stumbled. In the latest bid, regional mediator Uganda will host talks between the government and its opponents on Dec. 28. Nshimirimana said the president's third term violated the deal that ended the 12-year civil war, which pitted rebel groups of the Hutu ethnic majority, including one led by Nkurunziza, against what was then an army led by the Tutsi minority. Nshimirimana said the post-war reform of the army had been "a successful integration" but Nkurunziza's actions had left it "profoundly divided." "Having caused the loss of army honour, Pierre Nkurunziza is not worthy of being called supreme commander," he said. The government has repeatedly dismissed concerns that the army could fragment, saying it was united through the ranks. 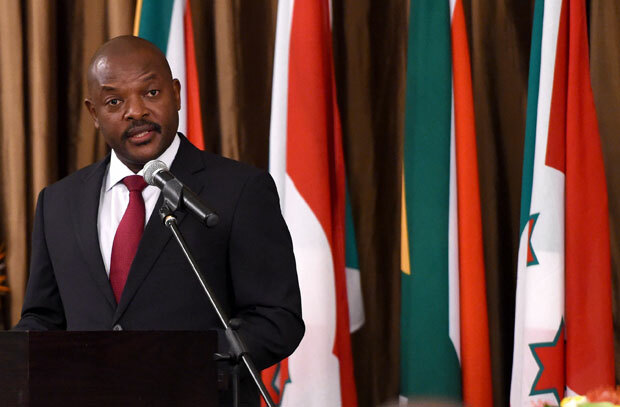 It also insists that Nkurunziza had the right to run for office again, citing a ruling by the constitutional court. Nkurunziza announced his bid for a third term in April and then secured re-election in a disputed vote in July.